This sounds like an incredible book! I'll definitely be checking it out. Sounds very interesting, and original! Great post! Thank for the giveaway! I am in the mood for a good paranormal like this one. It took me away reading about the trees swallowing him. Then, she has the courage to walk through the trees. Would love to win and read it. Great Q&A with Ruth Frances Long! The book sounds good. Nice cover. 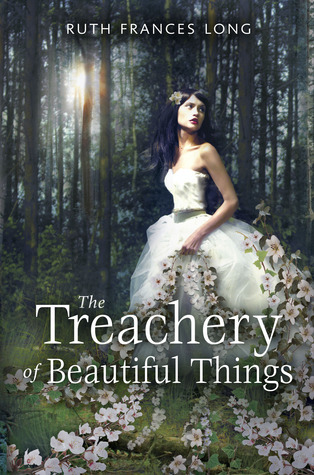 I've really been wanting to read The Treachery of Beautiful Things. Thanks so much for the chance to win! EJ, I like how Ruth cast her characters! I'm curious about the interaction of Jack and Jenny! Enjoyed the interview! Great interview! I love coming to blogs and learning about new authors! The book sounds amazing, and will be going on my TBR pile. :D mmmmm Gerard Butler! Now I can see him playing someone in the book lol. Thank you for the great giveaway.